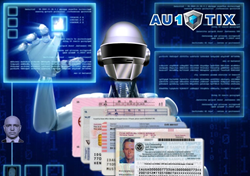 The new machine-learning algorithms patented by AU10TIX are particularly effective in increasing processing speed and accuracy of forgery detection in non-standard (non-MRZ, non-barcode) and borderline quality ID document images. These capabilities can surpass human expert capability and boost fraud prevention and regulatory compliance, while increasing operating efficiency and conversion success chance. The new machine-learning algorithms patented by AU10TIX are particularly effective in increasing processing speed and accuracy of forgery detection in non-standard (non-MRZ, non-barcode) and borderline quality ID document images. AU10TIX, the forerunner of 2nd generation ID authentication and fast-track onboarding is already serving many global major players in a range of financial services and other verticals. The newly announced patented algorithms increase the capability and performance gap between 1st and 2nd generation “ID authentication” technologies. While 1st generation solutions rely primarily on MRZ or barcodes for document recognition and focus mainly on data based forgery detection, 2nd generation technology can carry out forensic level image manipulation and synthetic forgery checks, and can handle sub-optimal image qualities at far better speed and accuracy, at 100% data-entry-free automation.